Do you manage your technical documentation? Or barely stay ahead of it? As technology changes, so do the methods required to design, create, manage, and maintain technical information. Today, your technical documentation must be delivered in multiple formats, across diverse platforms, to various end-user audiences, and in several languages. Doing so with efficient, consistent strategies is a constant challenge. I'm a Technical Communications Strategist who specializes in designing documentation systems that work for the long haul—and are scalable as your publication needs grow. I can help you develop the documentation systems, processes, and conventions you need to respond to rapid change. I practice single-sourcing methods to keep documentation systems lean and to make development and maintenance easier, even with multiple authors. These methods also help reduce the time needed to review documents for legal and compliance issues. Ready to learn more? Check out my services and latest projects. Did I meet you at MadWorld 2017? 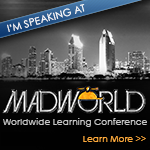 I was thrilled April 3-4, 2017 to present at MadWorld 2017: Go Easy on Yourself: Designing Easy-to-Maintain MadCap Flare Projects and To “Template” or Not to “Template”?. If we made our acquaintance, you’ll recall that I was on a mission to connect Flare users with other Flare users in their locales. If I haven’t already reached out to you, or you to me, please use the Contact page to get in touch with me.